When it comes to reading with young children, sometimes it’s hard to know where to start or how to make it a fun bonding experience you’ll want to share again and again. But don’t worry, help is at hand with our top 5 tips! Joanne Sarginson has been working with us since September as People Intern at our head office in Liverpool. She writes for The Reader Online about her own personal experience of reading being shared within her family – particularly with her brother – and the significant impacts it can have. My brother was diagnosed with dyslexia at the age of eight. I was ten at the time and had recently discovered the Harry Potter series. As a result, I thought that ‘dyslexia’ sounded like a spell everyone’s favourite boy wizard would utilise in order to disarm an aggressive Death Eater. Dyslexia had a significant impact on my brother’s relationship with books and the way in which he perceived reading in general. In the years following his diagnosis he visited a series of specialists, almost all of whom recommended that he read for at least an hour per day with one of my parents. The idea was to make books more accessible. By reading aloud, my brother was forced to engage with the writing before him. The words were no longer a cluttered mass of letters on a page and were instead clearly verbalised, allowing him to establish a greater connection both with the characters in the book and message that the author was trying to convey. However, although he was making progress, a sense of obligation soon began to develop around the idea of reading. Every time that my brother picked up a book, he did so under the impression that there was something wrong with him – that he had ‘special needs’ and that he was reading in attempt to fix himself. As a result, reading quickly became an activity that he associated with pressure as opposed to pleasure. He was increasingly reluctant to read. Eventually, my mum was forced to entice him into his daily reading sessions under the condition that she would reward him with a Curly Wurly at the end. “For me, one of the best things about reading is the sense of shared experience. It is comforting to establish a connection with a character, to visualise an element of yourself within them, something which enables you to think ‘that’s what it’s like for me’. Captain Underpants is a children’s book series in which two mischievous school children hypnotise their headmaster, compelling to remove his clothes and perform heroic acts in his underwear. I asked my brother in what way he felt related to Captain Underpants. Was it the idea of a lack of control, the feeling as if he didn’t have total authority over his own actions? ‘I wear underpants too,’ he said. I read Mark Haddon’s The Curious Incident of the Dog in the Night-Time with my brother when he was fourteen years old. Before this, my attempts to read with him had been largely unsuccessful. I did not possess the natural authority of a parent figure and, unlike my mum, did not have access to a supply of coveted Curly Wurlys. As a result, my offers were frequently met with a range of responses, including ‘no’, ‘nope’, ‘no way’, ‘nah’, ‘not going to happen’ and ‘books are gay’. My brother’s lack of interest in books frustrated me and I would often moodily contemplate what gave him the right to so forcibly reject my noble and selfless sacrifice of my time, let alone comment on the sexual orientation of a piece of literature. On the rare occasions that he did allow me to read with him, his focus would be erratic and he would rapidly become disinterested. ‘that’s kind of a little bit how I feel too’. Over the course of a month, we made our way to the end of Haddon’s novel. A few weeks later, I found my brother reading The Hunger Games. There were no Curly Wurlys involved. He had volunteered as tribute. Last month, just days after our 2015 AGM, we headed to Sheffield for a special event showcasing and celebrating the impact of shared reading. 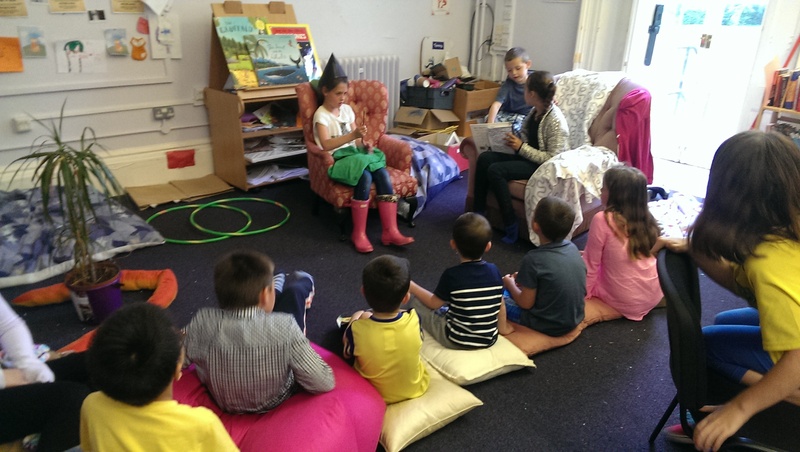 We’ve been working with Sheffield Health and Social Care Trust since 2011, and for the last year have had a dedicated Reader-in-Residence delivering shared reading sessions across the trust in inpatient, community and primary care settings. Staff and volunteers from across the trust, including those who have lived experience of mental health, joined us to share their personal experiences of shared reading and the differences it has made to them both personally and professionally, in their jobs and communities in which they live and work. As well as hearing these powerful first-hand testimonials, there was the chance to read a selection of poems collectively – and enjoy a slice of specially-made Reader cake! “Mia Bajin, the Patient and Public Involvement Manager at SHSC, who was instrumental in Sheffield commissioning a Read to Lead course way back in 2011, talked about the history of the project and about how much has been read since it started – it’s almost the equivalent of reading every Shakespeare play 15 times! After hearing from our Reader-in-Residence about the range of groups that have been set up and supported by The Reader in the past year, we got to hear from Read to Lead trained mental health and social care professionals and how the training has impacted trust service users directly through the delivery of shared reading. We broke out into three shared reading sessions in which we read Wood Grouse on a High Promontory Overlooking Canada by David Guterson (thanks Shaun!) and Evening by Rainer Maria Rilke. Finally, we heard from Trust Chief Executive Kevan Taylor who talked about his own personal reading experiences, and what reading meant to him. Of our work he said, “the evidence base [for shared reading] is clearly there”. “On the day, I was caught up in the moment and was kept busy hosting the event and speaking about my experiences, so much of the morning was, I confess, rather a blur. For me the event was the culmination of a year’s work which began in November 2014 as I joined The Reader, since when I have been working to develop my skills as a shared reading practitioner alongside building up a solid relationship with colleagues in the Trust, in order to establish and develop my groups. I was thrilled to realise the depth of feeling for the work that I have undertaken at SHSC over the past year. 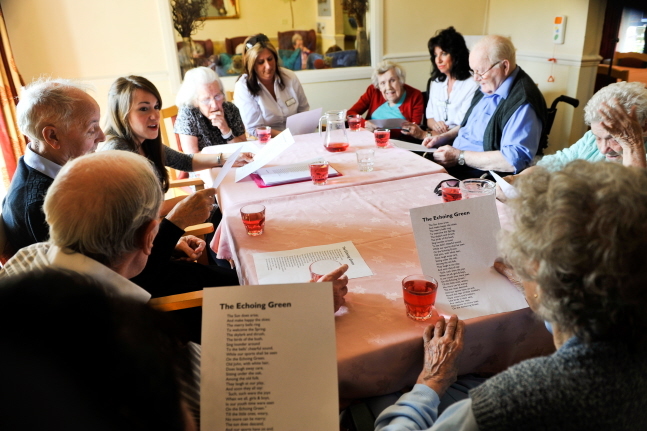 I got a real sense of the strength of the connections that had been made between people on the wards, and of the lasting effects of the shared reading groups which extended beyond each of the weekly sessions. I was also delighted by the sense of pride in the project that was evident in the volunteers, ward colleagues and recent Read to Lead trainees here at SHSC, and hearing the testimonials from them was for me, a real joy. Indeed, to hear first-hand experiences from staff about the impact of those groups on service users, and also with staff alike, really brought home to me the difference that the work of The Reader is making to people’s lives across the Trust. Congratulations to Shaun and everyone involved in making shared reading such a success in Sheffield. This month, The Reader Organisation is getting an exciting new partnership underway – unlike any other we have embarked on before. We’ve been commissioned by Phoenix Futures, a leading provider of services for people with drug and alcohol problems across the UK, to set up a shared reading project which will improve the health, wellbeing and emotional experience of those involved. Following the successful delivery of a group at Phoenix Futures in Wirral since 2005, this project will be rolling out the benefits of shared reading nationwide. Over twelve months we will pilot the development of a culture of shared reading across the organisation’s work with service users, staff and volunteers, based on a jointly held value that every person who is dependent on drugs and alcohol has the ability and the potential to rebuild their life. Our various shared reading projects in the sphere of health and wellbeing have proved to have deeply profound personal, social and educational impacts upon those who take part. Of particular importance is the relaxed, informal atmosphere that is created at every session – which can offer a respite and take people away from the problems they may be experiencing elsewhere in life – and the fact that reading aloud doesn’t excude anybody, no matter what their abilities. Not only does our shared reading activity promote recovery, it also builds supportive communities and improves quality of life. Having built the foundations, we’re very much looking forward to getting shared reading up and running and woven into the fabric of Phoenix Futures. Poetry: The New Tools of the Trade? Here at The Reader Organisation we firmly believe that reading poetry (and prose, too) in a group setting – such as the shared reading groups we run across the country – is beneficial for the reader’s mental health and wellbeing. Not only is it a social activity, but it is proven to increase group members’ self-confidence and self-understanding. 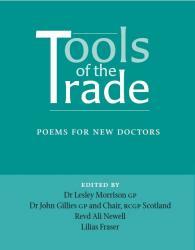 Our belief in literature has been reiterated by the Scottish medical community who, in collaboration with the Scottish Poetry Library, have published Tools of the Trade, a poetry anthology which has been gifted to every graduate doctor in Scotland this year. Whilst some of these poems specifically refer to medical life – Michael Rosen’s ‘These are the Hands’, and ‘A Medical Education’ by Glenn Colquhoun – many also deal with the ideas of moving on, moving forward, and dealing with difficult situations. These literary tools are not only invaluable for the mental health of the new doctors in providing a space to explore common medical situations (both humorous and serious), but there is also a focus on the patients’ view of medical life – and what doctors can do to improve this. Arguably, many of the graduate doctors may never read the anthology; however its presence both in their lives, and the fact of its actual publication demonstrates how integral poetry is for a person’s wellbeing, regardless of their occupation, interests, or personal situation. Author LisaPosted on 6th August 2014 16th February 2017 Categories Authors, Book News, Classics, Health, Well-being & Community, Poetry, Scotland, UncategorisedTags graduation, medical students, Reading, Scotland, Scottish Poetry Library, Tools of the TradeLeave a comment on Poetry: The New Tools of the Trade? Her Royal Highness the Duchess of Cornwall visited the group, which is specifically for people living with dementia, at the reopening of Exeter Library. Alongside group members, the Duchess enjoyed some pieces of great literature as they were read aloud, proving to be a wonderful addition to the Royal tour of the South West. The Duchess is known for being a literature lover and continues to work to promote the benefits of reading, especially amongst children and young people, and enjoyed reading throughout the day with the official reopening of Exeter Library which includes thousands of new books upon the shelves. As well as listening to the extracts as they were shared her Royal Highness also spoke to Jennifer McDerra, The Reader Organisation’s South West Development Manager, about our work in the area and across the country. Our first Royal member of the Reading Revolution – perhaps Her Majesty will also be taking part in a spot of shared reading before very long…? Children’s Book Week may be coming to a close but there’s always time to dive into the world of children’s literature. Here at The Reader Organisation, we think that you’re never too old to enjoy a classic piece of children’s literature, and with titles including The Hunger Games trilogy and The Fault in our Stars breaking out of the young adult section into the bestsellers charts overall, age really is no barrier to finding a good book to get stuck into. The world of literature aimed at children is an ever burgeoning one, with e-readers and the ability to download reading apps onto mobile phones and tablets meaning that young people have more opportunity to read however and wherever they want. However the latest figures from Publisher’s Weekly (February 2014) show that the majority of teenagers generally prefer to read in the classic print format, which is great news for book sales and libraries. In the US, young adult and picture books make up the two bestselling categories for 2013 – demonstrating the wide appeal and range of books coming under the category of children’s literature – and in fact the group that bought the most young adult titles were 18-29 year olds, with data showing that even as book buyers get older they still buy young adult titles for themselves to read as opposed to giving them as gifts for children or grandchildren. Did you know…that a fifth of the £2.2billion spent on books each year in the UK is spent on children’s books, and around 10,000 new titles aimed at children are published in the UK every year? Though unsurprisingly the Harry Potter series are thought to be the biggest selling children’s books of all time, the figures are hard to pin down – by 2011, 450 million copies had been sold worldwide but hundreds of other copies sell by the second – the official numbers put The Hobbit by J.R.R. Tolkien at the top of the pile, with 100 million copies sold. The classic tale of Bilbo Baggins’ quest for a share of treasure guarded by a dragon has enchanted kids and adults alike, and was awarded the prize of ‘Best Juvenile Fiction’ by the New York Herald Tribune. The next two most popular on the list are The Lion, the Witch and the Wardrobe by C.S. Lewis and Charlotte’s Web by E.B. White, which shows the enduring power of classic books. The Mr Men books – a staple of childhood reading for many people – came to life when the son of author Roger Hargreaves asked him what a tickle looked like. Mr Tickle was the first book to be written, with another 48 titles following. The series has been translated into Mandarin, French, Spanish and Dutch amongst other languages. Dr Seuss originally planned to spend a week or so writing The Cat in the Hat – it actually took a year and a half to complete. Amongst the titles that have been banned in parts of America are Winnie the Pooh, Where The Wild Things Are and Charlie and the Chocolate Factory, the latter of which was said to portray a ‘poor philosophy of life’ to young people. If you’d like to discover more about the world of children’s literature with expert knowledge from TRO, why not come along to our latest Short Course for Serious Readers which will take you on a Whizz-tour on the wonders that are to be found. Join us on Saturday 12th July at Calderstones Mansion House where we can point you in the direction of some of the best books to read with children just for the fun of it, ranging from brand new treasures to old favourites to rediscover. Places on the course cost £30/£15 concessions, and we can offer a special 10% discount if you bring a friend who is new to our Short Courses. It’s the perfect way to get ready for The Secret Garden of Stories, our first Children’s Literature Festival this coming August.